0 comments, 22/08/2013, by IAmNotARapperiSpit.com, in Do The Knowledge, Dont Believe The Hype, Who?? Rev. Dr. Ishakamusa Barashango began his journey to Nsamando, the land of the Ancestors on January 14, 2004. The dynamic minister, author, historian, educator and motivational speaker was born April 27, 1938 to Florine Mason in Philadelphia, PA. 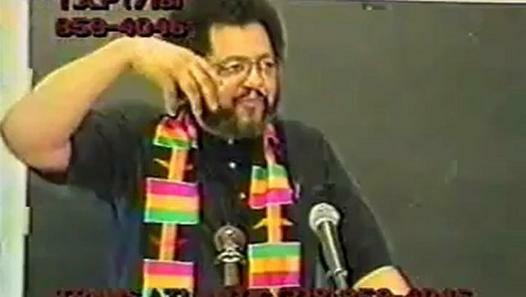 He earned a Bachelor of Arts in Religion from Oakwood College, Huntsville, AL and was awarded Honorary Doctor of Philosophy Degrees from the College of Doctors of the New Afrikan University Network System, Washington, DC and the Sankore Institute operating under the auspices of Texas Southern Universty, Houston,TX. Rev. Barashango founded the Temple of the Black Messiah, School of History and Religion and co-founded Fourth Dynasty Publishing Company of Silver Spring. He also taught history and religion at several colleges and universities. In August, 1996 he married Lydia Umyemi who worked with him to establish the Temple of the Black Messiah, New World Church of All Faiths, Philadelphia, PA. Baba is survived by his wife Lydia Umyemi, his children; Daima Abdur-Rasheed, Wayne (Chaka) Mason, Damali Mason, Osagefo, T-Shaka Changa Cunningham, Njema Walker, Imari Marcel Nialah Barashano Washington, several grandchildren, and a host of grandchildren. Condolences and donations may be sent in care of Lydia Umyemi, Cornucopia, 4942 Parkside Avenue, Philadelphia, PA, 19131. A tribute is planned for February 14, 2004. Dr. Barashango departed from us to another sphere on January 14 in Philadelphia. He apparently succumbed to a heart attack during his morning walk. Barashango, who was elevated to a grand master scholar in 2000 while in Kemet and co-founder and creative director of the Fourth Dynasty Publishing Company in Silver Spring, Maryland, would have been 66 in April. Dr. Barashango, affectionately known as Baba, received his bachelor of arts degree in religion from Oakwood College in Huntsville, Alabama. He studied for his master’s degree at Northeastern Seminary in Takoma Park, Maryland. The New Afrikan University Network System of Washington, D.D. saluted him with an honorary Doctor of Philosophy Degree in 1979.